Well said, and its high time that these vile practices of Government interference were outlawed. The pomp and pageantry are just window dressing on a cesspit that becomes hidden by colourful and distracting delusionary images of merely an OUTER appearance, not the inner state of Public affairs – no different to cheap baubles on an artificial Christmas tree. The artful chicanery of the likes of the Privy Council and other secret forms of “government” (such as the lawless “Law Society” and shape-shifting ‘Bar Council’ and thieving County Councils – all privately run Corporations who create their own Rule Sheet which is never disclosed to those they choose to ‘play’ with, to ensure they “win”) are oppressors of the worst order, committing acts of tyranny against the British people and inhabitants of England, who can never be deemed to be answerable to the shady and depraved practices of these unenlightened beings. This blog is the result of one ‘seasoned victim’ working with Brad Meyer who has been creating collaboration between many opposing camps in his professional life. Here he is aiming at a better understanding between victims of white collar crimes who become Litigants in Person and the judiciary. I never thought I could get involved in individual cases. I felt too help- and powerless and too ignorant about courts and legalese. But my colleague Brad Meyer began by designing a template and I got involved in writing one-page summaries. We wanted to group cases to enforce the Bank of England Act 1694 that was designed NOT to oppress Their Majesties’ subjects. 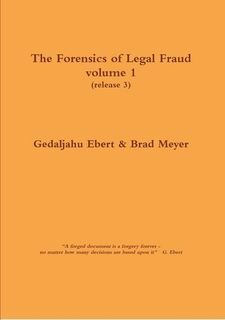 After spending a lot of time with Mr Ebert, Brad produced Volume 1 of The Forensics of Legal Fraud with him, one of four key cases of fraudulent bankruptcies. I ended up producing Volume 2 with Paulette H Cooper who is one of these four cases. These are real live cases – for students to study, for adults to consider – as a warning and possibly wake-up call – and as support and consolation for all other victims. We believe that bankrupts have no chance of ever getting restitution or compensation for the injustice they have suffered. But we also trust that, together, we will make some difference some time. Bloggers as victims? They need to be gagged to protect child snatching from being shown up! Bloggers unite! Get gagging orders or ‘injunctions’ to comply with people who don’t want you to expose their criminal behaviour. Here’s what I published about state kidnapping before. 29 Case Stories on Enforcement of Bank of England Act 1694 and Victims Unite! under Our Cases as Stories on Victims Unite! and as an email to UK Column who were looking for stories! Click here for the latest statistics as well as collated comments. For the complete chronology of websites please go here. Please see on the link below photographs of a criminal breaking, entering and trespass by Lincoln County Court Bailiffs, locksmiths, an HBOS representative whilst three police officers stood by and watched them commit these crimes. There are hundreds of these illegal possessions and unlawful bankruptcies happening every week in the UK leaving people shell shocked and traumatised, not to mention homeless. Many of them do not even understand their rights or why the Law and the Courts have failed them. We do however know that the greed of the criminals working within HMCS is the real problem! Hello and Welcome to Room 14!